Toothette Plus Suction Swab Single-Use System are designed for use by professionals with patients who cannot expectorate and cannot perform their own oral care. Provides complete oral hygiene with suctioning for patients who may also suffer from mild, moderate or even severe oral dysfunction. Attach to standard suction line for single-handed cleaning, debriding and suctioning in one easy-to-use tool. Patient is more comfortable and experiences less trauma then with Yankauer or other suction instrument. System contains 2 Suction Swabs with Sodium Bicarbonate, 0.25 fl Oz/7 ml in a burst of ready-to-use Perox-A-Mint 1.5% hydrogen peroxide solution that rehydrates the oral mucosa. Comes in convenient, economical dispenser box for bedside oral care. Easy to Use. Soft on the gums. Prevents bacteria . I use this product to clean my Dad's mouth ensuring that there is not opportunity for bacteria to build in hidden places. We use it morning and night. It is a safe and easy way to clean his mouth when we have his dentures out . . . especially when he can not do it for himself. Great product used at hospitals. 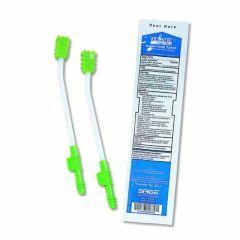 We use this product everyday after brushing to rinse with mouthwash or water by swabbing around gum and the whole mouth.